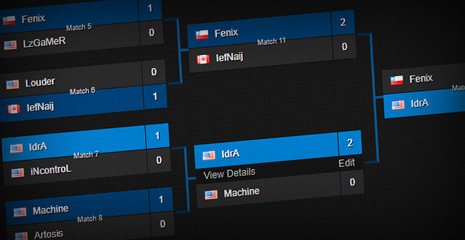 Ensuring tournament management simplicity, since 2008. We currently offer Single Elimination, Double Elimination and new with BinaryBeast version 5 Round Robin group stages. With BinaryBeast you can create a tournament in just a few minutes, send out invites or let people join the tournament themselves. With our advanced permissions system you can give various levels of admin access to other BinaryBeast users. Our recently re-designed score reporting system allows participants to report their own match scores just like admins. That's right, this service is entirely free however donations are appreciated. We believe that BinaryBeast is intuitive designed. However, should you be experiencing any difficulties please refer to our Frequently Asked Questions. If your question isn't covered in our FAQ, feel free to drop us an e-mail. We are happy to provide assistance and answer any questions. The BinaryBeast API allows web developers to fully integrate our tournament services into their websites by granting remote access to our back-end services. Simply, it allows you to develop a direct interface that allows your users to join tournaments and report their own wins; all direclty through your website. Despite extensive testing which resolved a number a bugs, we are aware that some issues may remain and would greatly appreciate your help in identifying them.